Something BIG is coming to Corn Wagon and we can't wait to tell you about it! YES! 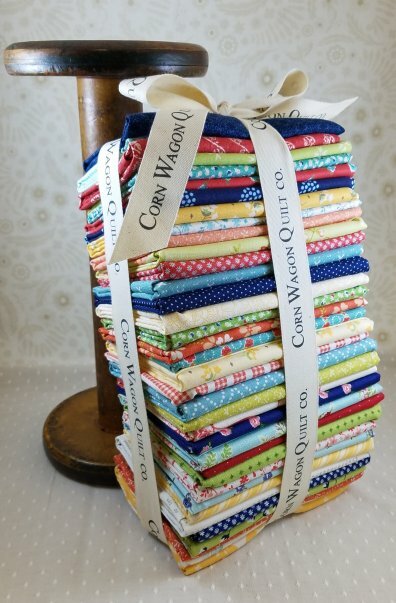 We are excited and honored to join forces with Amy McClellan of Under The Garden Moon to bring her Saturday Sampler to Corn Wagon Quilt Co! Amy has designed a BEAUTIFUL, original mystery quilt pattern for our shop and is helping us organize a 12 month program. We can't show you what the finished quilt will look like but we can share the wonderful fabric palette (shown below - - IT'S FABULOUS!) we have worked together to coordinate. We can also tell you the finished quilt includes several different blocks, a handful of which include applique, so like Amy's past Saturday Samplers, this quilt will be a skill building program where you will be introduced to tools, products and techniques. You will learn LOTS! Amy will be at our shop for our first Saturday event to help us kick things off. Each month thereafter, one of our great Corn Wagon instructors will teach block demos with an occasional spotlight feature from Amy! So when does all the fun begin? Our Saturday Sampler will take place the 1st Saturday of each month for 12 months, beginning Saturday, August 4th, 2018! Registration begins May 10th and ends June 30th in-store and online. $40 non-refundable sign-up fee due upon registration. Demos and monthly kit pick-up will take place the 1st Saturday of each month beginning August 4th. Demos will be scheduled throughout the day (times TBA). Monthly kits include patterns and fabrics for that Saturday's block(s). First month's kit is FREE! Attending a demo is not mandatory. However, if YOU personally come into the shop the 1st Saturday of each month to pick up your kit & bring your last month’s blocks to show us you finished your monthly assignment, your current month's kit will be FREE! Otherwise, monthly kits are $5.50 each. Optional finishing kit will be available to purchase at a discount. Rules apply and will be clearly noted upon registration. You never know when we will throw in a special offer or coupon exclusive to our Saturday Sampler customers but I can guarantee it will be often. It's all part of the mystery fun! Please note that the fabrics shown here are for color scheme & style representation only. Exact fabrics may or may not be included in the finished quilt but will closely resemble those shown here. Watch for our new class schedule to be released May 10th. April 23rd - 25% off all regular price BOOKS & PATTERNS! We feel honored to be a part of such a wonderful quilt-making community.